The Software industry in Karnataka state in India has become one of the main pillars of economy. Karnataka stands first among all the states of India in terms of revenue generated from software exports. If you are planning to set up Software Company, Government of India & State Government provides various Tax advantages to the entrepreneurs to promote Software Companies. Tax Incentives available to Software Companies applies depending upon the location of project like SEZ EOU etc , There are different Tax incentives available for a Company having place of business in SEZ than of those not having place of business in SEZ. SEZs are developed to encourage the companies to engage in export of goods and articles or services. There are various benefits given to the companies having units in SEZ under Direct taxes as well as Indirect taxes. The profits from SEZ unit which is exempt u/s 10AA will also not be liable for Minimum alternative tax. If the company declares dividend, then the company has to pay dividend distribution tax @ 16.995%. If the SEZ units makes sales within India, then the taxes as applicable to Non SEZ units will be applicable and other benefits might be withdrawn. If there is no income tax liability on the income, minimum alternate tax @ 18.5% on the book profits plus surcharge @ 5%/10% if applicable and education cess at 3%. 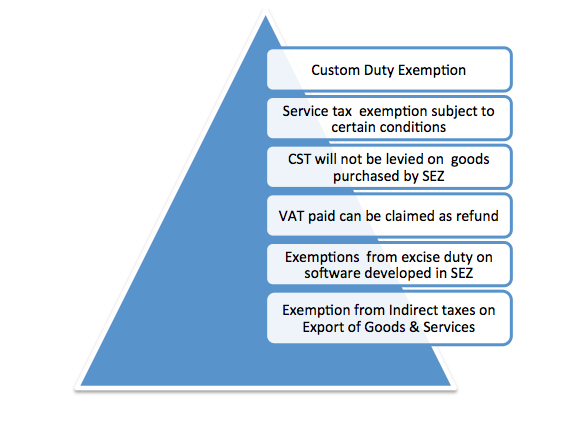 Customs duty on imports at applicable rates. Excise duty at applicable rates. Central sales tax at applicable rates. Value added tax at applicable rates. Applicable taxes on sale of goods and articles or provision of services. The Karnataka Government recently announced various fiscal and non-fiscal incentives to give an impetus to Information Technology (IT) and Bio-Technology (BT) industries in the State. In order to enable identification of eligible units so that these incentives can be applied to them, BT and IT units need to obtain a Registration from the designated registering Authorities. a) Under Millennium IT Policy the companies engaged in IT activities are exempted from the payment of ‘Entry Tax’ on capital goods and purchase tax on computer hardware, computer peripherals and other capital goods including captive power generation sets, during the implementation stage which can be extended up to five years from the date of commencement of implementation. b) IT industries will be offered sales tax exemption for a period of 10 (ten) years or deferment for a period of 12 (twelve) years, subject to a ceiling of 200% (two hundred percent) of the value of fixed assets. c) Captive power generation sets installed by the Information Technology Industry will be eligible for the total exemption from payment of electricity tax without any time limit. d) Power: Software companies will be treated as industrial (and not commercial) and electricity tariff applicable to the industrial consumers will be levied on such companies. These industries would be given priority in sanction and servicing of power and would also be exempt from power-cuts without any time limit. a) All new IT companies which create employment of more than 250 in Bangalore & 100 in other areas during the first year are eligible for rebate on the stamp duty @15% and rebate on the cost of the land @15% in case companies get land from the state agencies like Karnataka State Small Industries Development Corporation, Karnataka Industrial Areas Development Board, KEONICS etc. b) Labour Law: The Labour Department has also initiated procedures to exempt the IT companies from the preview of Industrial Employment (Standing Orders) Act 1946 and other relaxations in maintaining certain registers and filing returns under other laws. Section 11 of the Shops and Commercial Establishments Act 1951 restricts the opening and closing times of any establishment and Section 12 requires closure of the establishment on one day of the week. Section 25 of the Act prohibits employment of women at night. IT industry will be outside the scope of section 11 and 12 of the Act. An amendment to Section 25 is also approved enabling the IT sector to employ women at night. a) Exemption from sales tax/works contract tax arising in the construction of the infrastructure facility for a period of three years or till the date of completion of the project, whichever is earlier. b) 50% exemption from payment of stamp duty and registration charges on the first sales of land in the case of IT Parks. c) Exemption from payment of entry tax on machines, equipment, capital goods and construction material procured for implementation of infrastructure projects, for a period of three years or till the date of completion of the project, whichever is earlier, subject to the condition that each invoice should be for not less than Rs.25 lakhs (Rs.1 lakh for construction materials). If the unit is registered under STPI, Company can import of capital goods without payment of duty. If the goods are procured from domestic manufacturer, no excise duty is payable provide certain procedures are followed. If activity is undertaken in the form of services and not in the form of development of software on their own, in such situation, Company will have to pay the full Central Sales Tax. 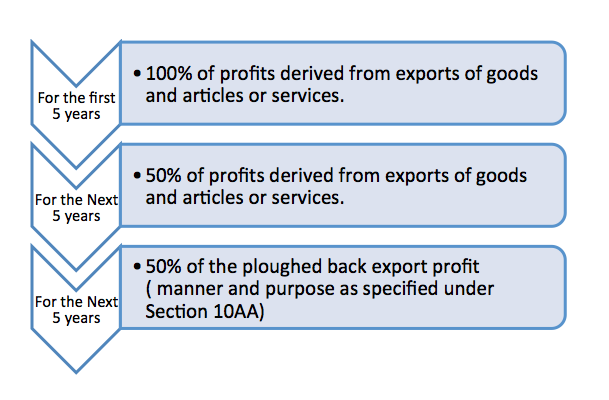 If any capital goods are procured from outside the State. In case of procurement of capital goods, there is no concession rate of VAT and Company will have to pay the full VAT & the same is not refundable. If Company is engaged in own software development, in that case they can procure the capital goods from outside the State and Central Sales Tax paid can be claimed as refund from the Development commissioner. In respect of VAT paid on local purchase (only in respect of eligible goods and on stationary or furniture etc), they can claim the refund. *However STPI scheme has been withdrawn in 2011 as far as benefits under Direct Taxes are concerned. . Author – Anu Kapoor, Associate with NovoJuris. This entry was posted in Articles and tagged software company, Tax, tax exemptions on April 25, 2014 by novojuris.